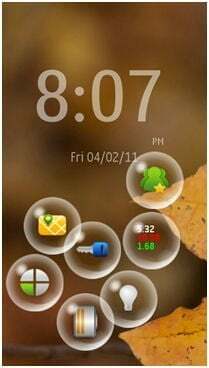 Nokia Beta Labs just released Bubbles for Symbian^3. Fast access to the most important things on your phone by catching a flying bubble! We don’t want to call it an App instead we say Bubbles is a fun and efficient way to take a shortcut to timely or useful things on your phone. Bubbles appear when you press the “MENU/APPS” key while your device is in sleep mode.Simply grab a bubble and drag it to one of the available drop points to initiate the corresponding action. 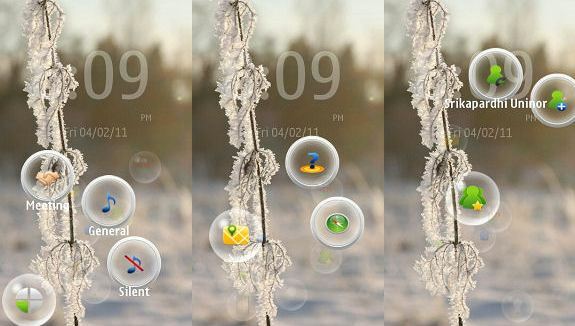 Bubbles is currently available for the following Symbian^3 Devices: Nokia C6-01, C7-00, E7-00 and N8-00 and its FREE. Bubbles can also be used to pass the time by “throwing” bubbles and watching them bounce back and forth around the screen. What can Bubbles Do for you? We tried on a Nokia N8 and this funny Nokia Bubble worked perfect in all the 4 directions of screens orientation. A must download for New Symbian OS and a good replacement for slide to unlock option with many more options. You can download it from the Nokia Beta Labs here. Please Note that this app is still in experimental stage and may have some bugs. Feel free to give your valuable feedback at Nokia Beta Labs and help in its enhancement. Get your copy and share your funny experiences with us ,we do love to hear ! Nokia is ignoring all the models marketed earlier while introducing new applications ! IT is not fair – All are not that rich to throw away their current mobiles as go for new ones as and when marketed – Either they should allow exchange facility (at considerable rate) or take back and recycle ! Kewl app! A must have ! Let me try !